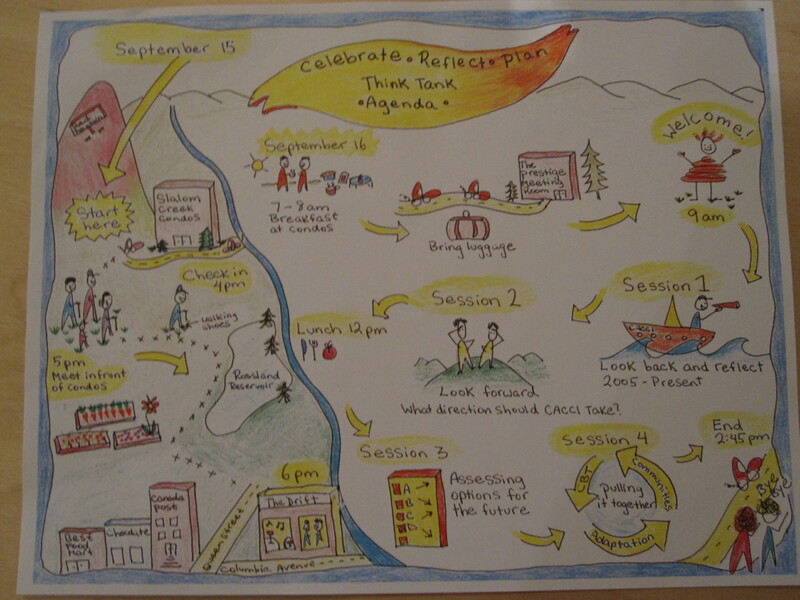 Graphic Agenda for climate change think tank made by 2010 workshop participants - Learning in Action! I am pleased to invite you to the 2nd annual graphic facilitation workshop and jam in Rossland, B.C., Canada taking place July 13-15, 2011. The very energetic and inspiring Nancy White will be joining us and is my co-conspirator for this visual event. We hope that you will join us for 2.5 days of writing on walls, thinking visually and having fun together. Full details below! This experiential workshop takes place almost entirely at the drawing surface. We’ll start the evening of July13th by warming up our drawing muscles and silencing those pesky inner censors. The second day, we’ll build into the basic practices of graphic facilitation and recording. We will pay attention to preparation, the actual visual work, and follow up including digital capture of paper based images. Our third day will be devoted to participatory graphic approaches, practicing and giving peer feedback. You can expect to go away with icons, ideas and approaches which you can use immediately, as well as ideas about how to hone your practice. When might we use this practice? Sometimes our imaginations are sparked by a visual where words fail us. Think about when communities plan and imagine their futures, when teams consider the possible outcomes for their projects, when groups create maps to track their progress. These are all opportunities to use visuals to engage and deepen community dialogue. You can use visual thinking to improve teamwork, communications, meetings, build engagement and to plan work. Step out of the PowerPoint rut! Facilitators, project managers, team leaders and members, town planners, teachers and anyone who would like to engage others beyond words. Please note: You do NOT need previous experience or have to consider yourself an artist. At some level, we can all draw and use visuals to enhance our communications and engage diverse audiences. Tonight we’ll touch the paper, play with the pens and loosen up our drawing muscles. We’ll address the basics of “drawing on walls” including starting shapes, lettering and some initial iconography. We’ll cover basic techniques and tricks that enable any of us to draw as a way of capturing and communicating ideas with each other. We’ll ask ourselves some questions, such as “What if you draw your notes instead of wrote them?” “Visually captured what is happening at a meeting or in a classroom?” “Engage people beyond words and text?” How would that change the experience for you and others? When we get tired, we’ll spend some time looking at the work of diverse graphic facilitators, see how books can inspire us and play a bit with materials. Dress for mess! For a sense of a very short I CAN DRAW session, here is 6 minutes from a lightening fast 45 minute workshop at Northern Voice in 2009. Description: In the morning we’ll explore how visuals can enhance group processes such as planning, meeting and evaluation. 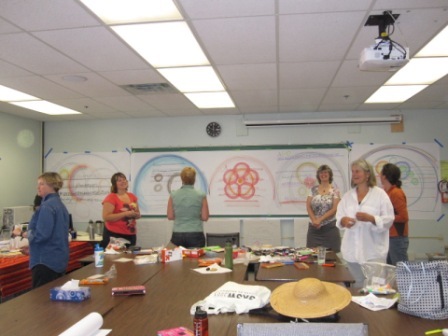 We’ll do mind maps, mandalas and simple flip chart enhancements that you can immediately use. We’ll look at the use of visuals with some specific group facilitation methods such as World Cafe, Open Space, Appreciative Inquiry, and others. This part of the workshop includes lecture, conversation and lots of hands on experience. We’ll explore practical applications while we continue to learn to write on walls, the base elements of the practice of graphic recording and facilitation. This afternoon we’ll focus on traditional graphic recording (actively listening and capturing what is going on in a group, rather than using graphics as a facilitation device). We’ll review and practice how to listen for key ideas, iconography, and organizing space. We’ll do a number of practice drawings then review our own work. We will hold several practice sessions in the safe space of the classroom. This time will prepare you to record confidently in real work settings. Building on our drawing and exploration of visual practices in whole group processes, we’ll experiment more with participatory graphics. This is when the pen goes into everyone’s hands, not just the graphic recorder’s. When people “make their mark” it changes their experience and ownership of the experience. It can open up how they talk and think about things. We’ll look at a range of participatory visual practices including methods such as visual icebreakers, “River of Life,” Knowledge Tree,” and other examples. Think about your group’s situations and needs and we can work to imagine practices that might help your real work! From 4-5pm each day – we’ll offer an optional opportunity to practice visual thinking and drawing of key words and icons. Come prepared to get your hands dirty. Dress is comfortable clothes that can get dirty and you won’t be sad if they are stained. Bring a pad of paper or journal to take notes – unlined is terrific. Bring a digital camera to record the fruits of your labor. We will supply the basic materials for the day, but you may want to purchase in advance your own set of materials. Details available upon request. The beautiful alpine city of Rossland, BC. Accommodation options have been suggested below. Please email michelle.k.laurie@gmail.com to confirm your participation. There are several nice B&Bs in Rossland. If you tell them you are attending Michelle Laurie’s workshop, you will get a reduced rate. We will contact the ones below to arrange this. Anyone interested in billeting or being billeted or questions re accomodation, please email me. http://www.visitred.com/ – private 2 bedroom suite and 1 single room, call Angela to discuss details, she always gives great service and great rates, 250 362 7790. There are several places in the workshop vicinity to eat a quick lunch.